Erie County lawmakers are considering ways they may regulate electronic cigarettes, in order to keep them away from the hands of minors. On Thursday in downtown Buffalo, members of the Legislature's Health and Human Services Committee heard testimony from experts and advocates who say vaping is not a safer alternative to traditional tobacco. They also explained how vaping is being marketed to young people. Vaping is already banned in public spaces in Erie County. Under legislation signed in late December, e-cigarettes and tobacco products are banned from sales in pharmacies. Lawmakers are exploring possible further steps to ease what was described as a rising trend during Thursday's committee meeting. Dr. Richard O'Connor of Roswell Park Comprehensive Cancer Center speaks at an Erie County Legislature Health and Human Services Committee Meeting Thursday. 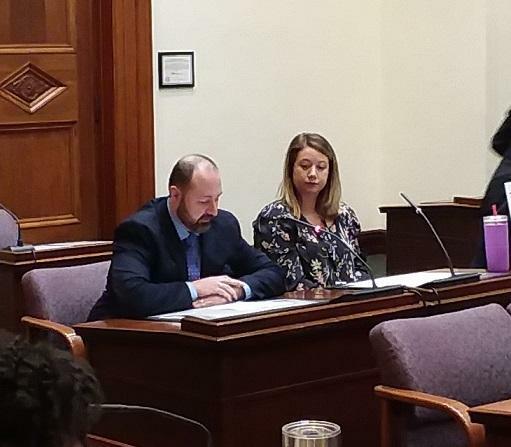 Seated with him is Lindsay Amico, youth coordinator for Tobacco-Free Erie Niagara, who also testified about vaping, its health hazards and efforts to lure young people toward its use. As he opened the meeting, Legislator and committee chairman John Bruso held up a full-page newspaper ad purchased by e-cigarette maker Juul, which states 34 million Americans still smoke cigarettes and encourages them to switch to their products. The ad also states that Juul is intended for adult smokers. Experts and advocates who testified before the committee Thursday said the vaping and e-cigarette industry are instead attempting to appeal to young people, using tactics including colorfully-designed devices and appealing flavors. They also spoke of a false narrative that e-cigarettes and vaping are safer options for those looking to quit traditional tobacco products. Jessica Hutchings, program director for the Face2Face Program at Kids Escaping Drugs, suggests kids are buying into that narrative. "When we talk with the young people, one of the biggest concerns that we have with this topic, because of the resistance we meet from them, is the denial that they have of the troubles of vaping," Hutchings said. "They have been under the impression through so much of this marketing, they've kind of been brainwashed to believe that 'Juuling' and vaping is a safer alternative to cigarette smoking, because that's how it's marketed for adult smokers." The first to testify was Dr. Richard O'Connor, who directs the Tobacco Research Laboratory ay Roswell Park Comprehensive Cancer Center. He cited a colleague's work which details youth using e-cigarettes and their likelihood of forming a nicotine habit. "Youth using pod-based cigarettes have nicotine intakes equivalent to those of cigarette smokers," he said. "Nicotine salt liquids often employed in pod systems may be perceived as less harsh and irritating, despite their high nicotine content. But when coupled with attractive flavors, they facilitate youth use." All four guest speakers agreed with the thought of forbidding e-cigarette sales to anyone uder the age of 21. Bruso also supports that idea but adds that he and lawmakers want more public input before they develop and pass legislation. "I'm not an expert on the effects," he said. "To craft legislation that doesn't work, because it only creates another problem, I'd really like to do it the right way. We've already reviewed the other counties (in New York) and some other counties in the country, We're most certainly going to look at that." Bruso is hosting a community forum March 6 at the Lancaster Opera House, at which time he hopes the meeting will draw school officials and parents, especially those of children of middle school age. Legislator Thomas Loughran, who also sits on the committee, recalled when smoking was outlawed in Erie Countys bars and restaurants. He owns an establishment in the Town of Amherst and looks back on the elimination of smoking within his business in a good light. He thinks the FDA "dropped the ball" when vaping was first put on the market. "One step forward with the smoking, now we're two steps backwards with maybe even a bigger problem because it sounds to me like youth are involved in this more than the smoking, that they're starting earlier and having easier access," he said. "When I say they dropped the ball, it created a billions-and-billions of dollars business. And now we're fighting it." There wasn't much opposition Thursday evening to a proposed Erie County law that would further restrict smoking and vaping in vehicles and outdoor spaces. What role does flavor play in e-cigarettes? How does it impact our health and our behavior? Those are a couple of the questions researchers at Roswell Park Comprehensive Cancer Center and University of Rochester Medical Center will be investigating over the next five years thanks to a $19 million federal grant. Federal officials called it a blitz — “the largest coordinated enforcement effort in the FDA’s history” in response to concerns that e-cigarette use has become an “epidemic” among youths. Sen. Chuck Schumer says the Food and Drug Administration should immediately ban e-cigarette flavors like candy and cookies that can appeal to young people in the wake of warnings that teens and children are increasingly using e-cigarettes. New Yorkers who use e-cigarettes will have to comply with the same limits on smoking cigarettes in public, now that Gov. Andrew Cuomo has signed a bill into law.